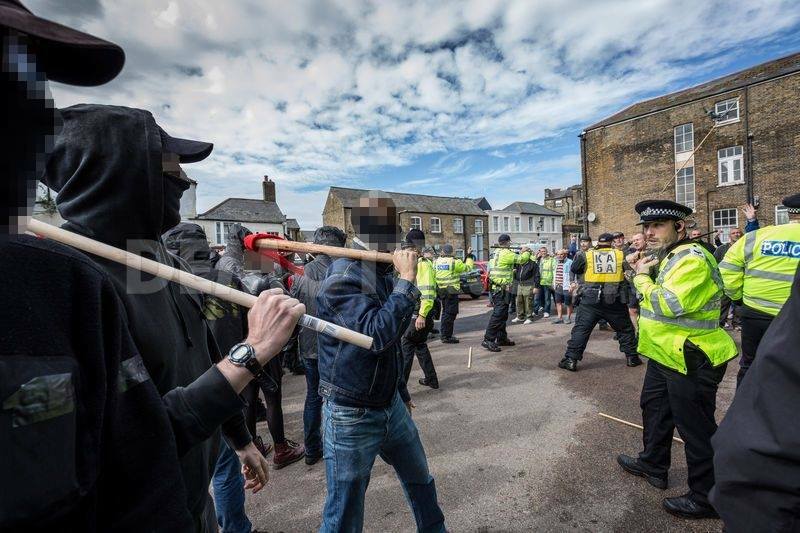 Around 200 neo-Nazis and racists rioted in Dover at an anti-immigration protest yesterday. Clashes with anti-fascists early in the day saw people on both sides hospitalised. 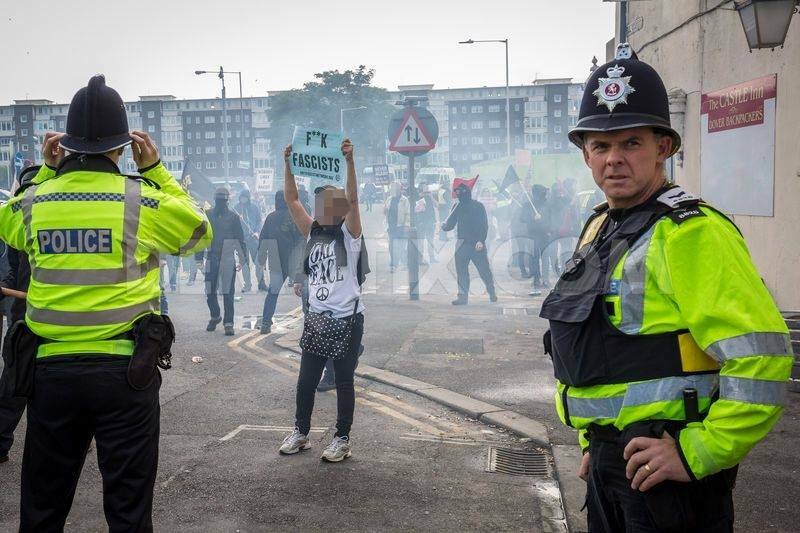 The protest was organised by the National Front (NF) and English Defence League (EDL) splinter group South East Alliance and supported by nearly every other group to have split from the EDL. A counter-protest was organised by the Anti-Fascist Network (AFN) and supported by anti-fascists from across the country. 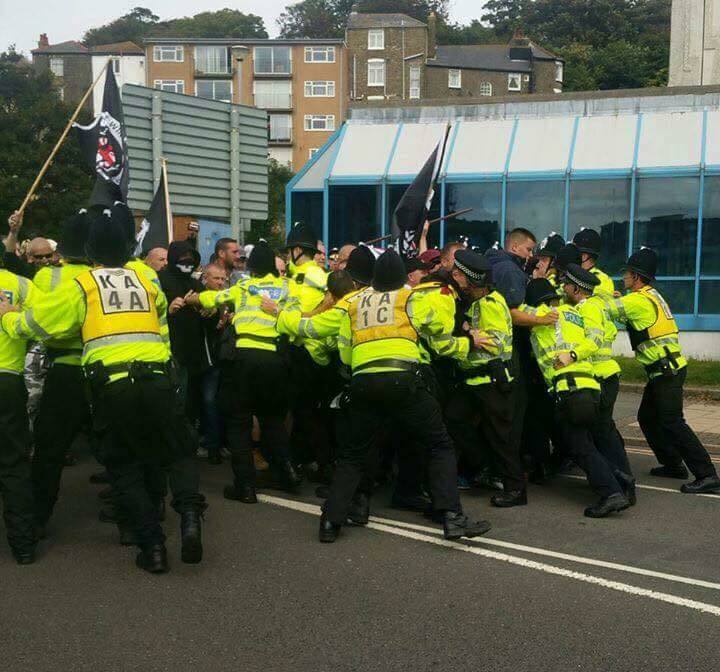 The day began with groups of fascists gathering in pubs around Dover. 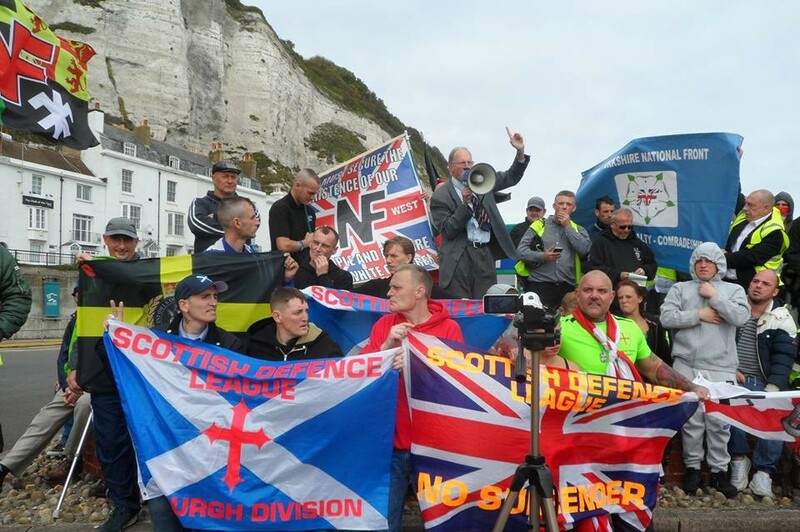 The AFN protest began at midday, a crowd of around 150 set off behind a banner calling for an open border and marched to the Castle Inn pub where the far-right protest was due to start. 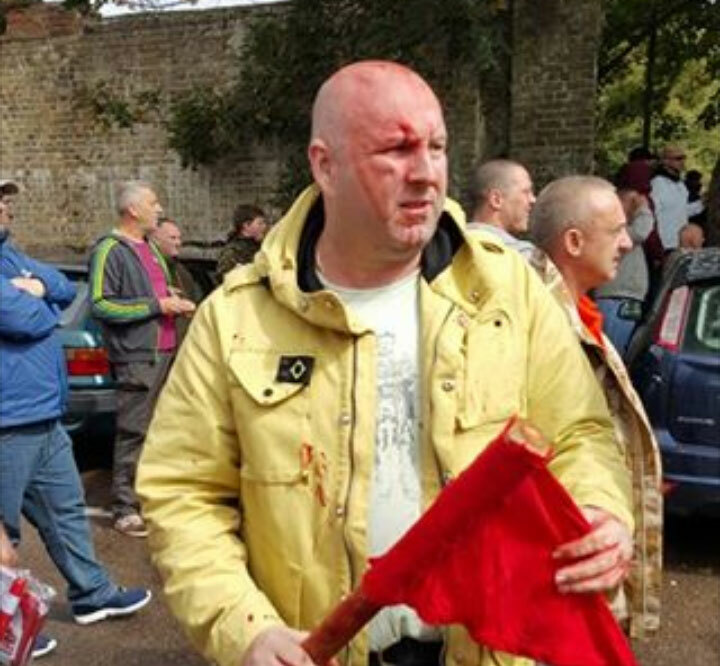 Kent NF organiser Mark Freeman was chased into the pub which was quickly surrounded by anti-fascists. While the police were trying to hold anti-fascists back more far-right activists arrived. The police rapidly put a cordon up along Dolphin Lane to keep the two groups apart. Smoke bombs were set off and missiles were exchanged including bricks, flares and bangers. Attempting to evade the police lines a large group of fascists came down Russell Street towards the anti-fascists but were successfully repelled before a police line was formed to separate the groups. As the police gained control over the situation on Dolphin Lane the far-right numbers on Russell Street swelled and there were several confrontations which saw fascists pick up severe injuries. Unable to force anti-fascists back, the far-right resorted to launching missiles, such as masonry and bottles into the anti-fascist crowd. These were returned and caused injuries on both sides. Eventually police reinforcements arrived and they forced the two sides apart and contained the anti-fascist crowd. Anti-fascists broke out of the containment and blocked the route of the fascist march. The initial confrontations outside the pub caused the police to slightly divert and delay the start of the fascist march. When the march started police again contained the anti-fascist group. As the fascist mob approached the junction which anti-fascists were on they repeatedly broke through police lines attempting to attack anti-fascists while brandishing Combat 18 and Nazi flags. Completely surrounded by police the anti-fascist crowd, which was reduced in number, was a sitting target for the fascists who had been carrying missiles with them from the pub car park. As the fascists were moved past the anti-fascists they launched missile including stones, masonry, padlocks and hub caps into the crowd, most of which was returned. Anti-fascists attempted to break through police lines to follow the fascists but were unsuccessful. While the far-right were holding their rally at the port anti-fascists decided to leave the area. Marching back through Dover loudly making the point “refugees are welcome here”, the anti-fascist crowd grew as it returned to Pencester Gardens where it dispersed. On the same day tens of thousands of people took part in a rally in central London in support of refugees. I'm sure there's a thread on libcom already debating ant-fascism, so I'll endeavor to look it up as I'm very interested in people's opinions on the subject. I'm not purposely trying to rub anyone up the wrong way - I apologize if it appears that way - but my first impression watching this video was how thuggish the whole thing seemed. It made me think of Chelsea and QPR fans having a punch up outside a west London pub. Maybe it's the chanting, swearing and flags, and the fact it's a predominantly male affair, but the whole thing seemed an overtly aggressive way to be spending your Saturday afternoon. The impression I am given from the article above is of the extreme Left and Right political wings of the British bourgeoisie playing piggy in the middle; arch reactionaries trying to return to business as usual. I don't understand the point you're making, jahbread. Are you saying that anarchists actively support the British bourgeoisie? 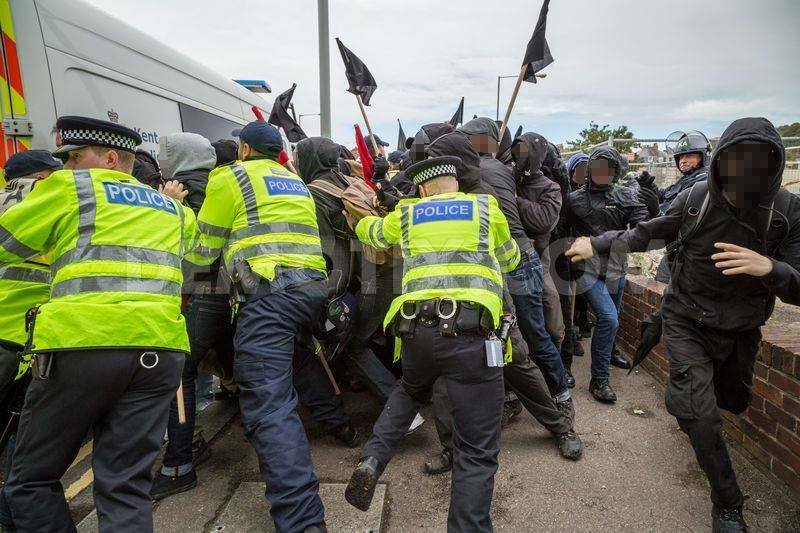 As an anarchist I support resistance to nationalism and racism, but I'm not sure that lobbing bricks in a Dover car park really makes much of a difference. I saw a video of the NF's rally that day and the word 'pathetic' doesn't really do it justice. As a communist I resist my own nation state (UK)..
From a communist perspective, the 'anarchists' represent the Free Trade camp (in the ascendency currently due to trade crisis), the 'Nazis' the protectionist camp. And that's what happens when you post to libcom while you're smoking crack. Just stop now.